A little bit of something to look forward to after dinner. With Thanksgiving and the holidays coming up, there is a lot of eating about to happen. One of the more underrated aspects of drinking is the lost art of the digestif, a slightly sweet drink of herbs steeped in alcohol. Digestifs are considered to help with digestion, something to do with increasing the production of digestive fluids after a large meal. But even if this is just a wives-tale, the ritual of drinking a delicious little something after dinner is a worthwhile process. Chow recently had one of their great articles on making digestifs. I have made a couple of these before but i liked the idea of making a bunch at once, so I decided to give a few of their recipes a shot. Place the basil leaves in a 1 quart jar with the Everclear and let it sit for 6 days at room temperature. After 6 days remove the leaves and add the simple syrup and stir. Store in the freezer and serve cold. Peel the lemons in wide strips trying to get as little of the white pith as possible. 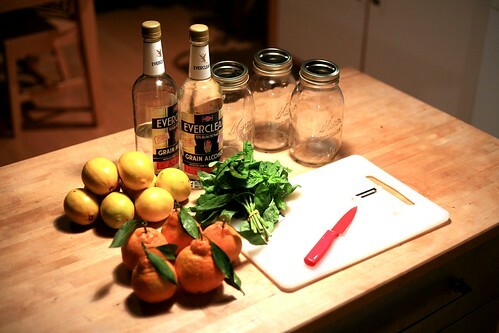 Place the peels and Everclear in a 1 quart jar for 12 days at room temperature. After 12 days remove the peels and add the simple syrup and stir. Store in the freezer and serve cold. Peel the Oranges in wide strips trying to get as little of the white pith as possible. Place the peels and Everclear in a 1 quart jar for 6 days at room temperature. After 6 days remove the peels and add the simple syrup and stir. Store in the freezer and serve cold. Update:I posted on how they turned out here. One thing I found was that the above recipes were very sweet, sweeter than anyone in my party could enjoy. I reduced the amount of simple syrup from 1.5 cups to 1 cup in the meyer lemon and mandarin and in the case of the basil (since it doesn’t have such a citrusy tang to it) i would reduce it to .75 cups of simple syrup. This entry was posted on Friday, November 21st, 2008 at 10:07 pm	and is filed under Cocktails, Infusions, Ingredients, Recipes. You can follow any responses to this entry through the RSS 2.0 feed. Both comments and pings are currently closed.